← Are Capacity Markets Necessary in Competitive Wholesale Markets? Can Solar Power on Our Rooftops Compete with Existing Generation on Price? Imagine a world in which photovoltaic (PV) solar power installed on the rooftop of your house was a cheaper source of power than the existing fleet of coal, natural gas, nuclear and hydro generating units. Such a reality would fundamentally change the world of electricity: Distribution utilities would become two-way networks that moved power among consumers and into storage during the day, and then from central units to consumers at night. Many existing generation units built to meet peak loads on hot sunny summer afternoons would no longer be needed except as backups for cloudy days. New transmission lines would not be required since power would be generated at the point of use. Emissions caused by electric generation would fall significantly. And electric service providers would go from a focus on buying and selling a commodity to providing financing and maintenance on PV units. But before getting too deep into your imagination, we need to ask – is this even feasible, or is it just a fantasy? After all, I’ve been hearing about the promise of PVs ever since I joined the electric industry in 1982! The average cost of retail power in the U.S. was 9.88 cents/kWh in 2010 according to the Energy Information Administration. This ranged from low costs just above 6 cents/kWh in Wyoming and high costs above 17 cents/kWh in Connecticut*. 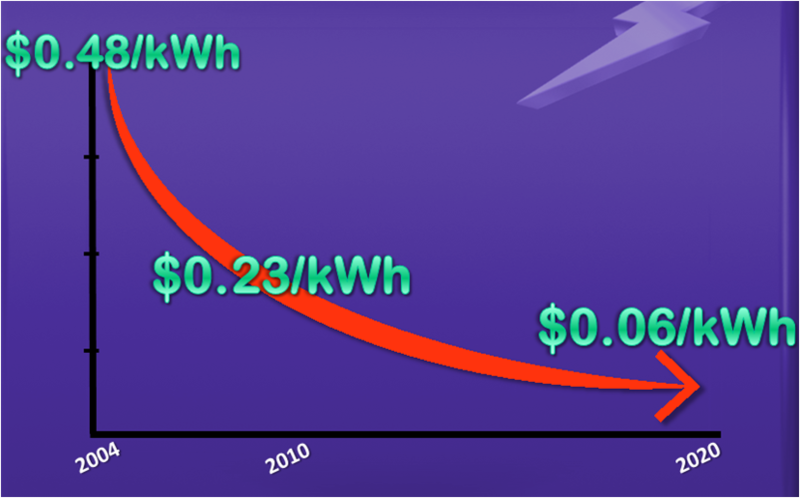 Current levelized costs for PV systems are around 20 to 24 cents/kWh. But they have come down a lot, by about 50% since 2004. And since PVs are electronic in nature, many in the research and development field believe that costs can keep coming down, just like they have for computers. In fact the Department of Energy recently announced the SunShot program with the goal of reducing the cost of installed PV systems to $1/watt by 2017. This is equivalent to about $0.06/kWh without any subsidies. The program envisions achieving the target through a number of cost reductions including cell manufacturing, installation and power electronics as well as improvements in cell efficiency. And in reading the details (available here: http://www1.eere.energy.gov/solar/sunshot/about.html) and talking to experts throughout the industry, it does indeed seem feasible. Lots of brilliant minds not just in the U.S. but in places like China, Japan, Korea, and Europe are working on it. Does this mean it will happen? Of course not. But it might. And if it does, it will fundamentally change our business. *We are ignoring the even higher cost state of Hawaii which is a unique case. This entry was posted in Renewables and tagged Energy Education, Photovoltaic, PV, Renewable Energy, Solar Power. Bookmark the permalink. 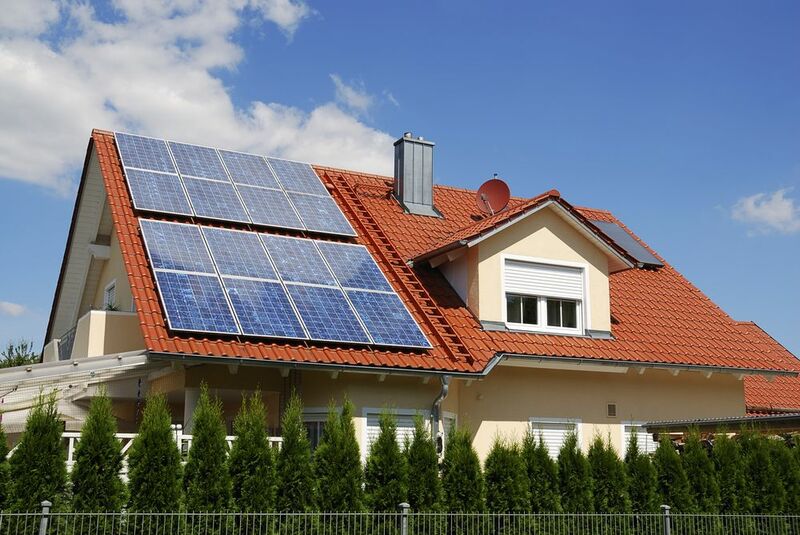 6 Responses to Can Solar Power on Our Rooftops Compete with Existing Generation on Price? Thanks for visiting our blog, Sando. I’m not sure I understand your question. I’m happy to give my insight but can you clarify what you are wanting to know? Many thanks!